The District is launching a new program to bring undergraduate college students from around the county to local classrooms, where they will teach K-3 students about air pollution and environmental protection. The program is free to all public schools and is modeled after the successful program started by San Luis Obispo County APCD and Cal Poly students. Clean Air Ambassadors are trained to present an innovative, interactive curriculum that meets California’s Next Generation Science Standards (NGSS). The lessons explore concepts such as pollution and sustainability, and promote environmental literacy. Students will conduct experiments to explore processes such as global weather patterns and air filtration, and learn about ways they can help improve air quality. Using Dr. Seuss’s “The Lorax,” our Ambassadors will demonstrate how air pollution can affect people and the environment. With the assistance of Ms. Frizzle and her Magic School Bus, our Ambassadors will demonstrate how air pollution can negatively affect people’s health and how children are more sensitive to air pollution than adults are. The students will experiment with various water filters to understand how filters work, interact with air quality sensors, and play games to learn more about the air we breathe. Students will form small groups and learn about air molecules, participate in a scavenger hunt and create a play using all of the knowledge they gained from the lessons. 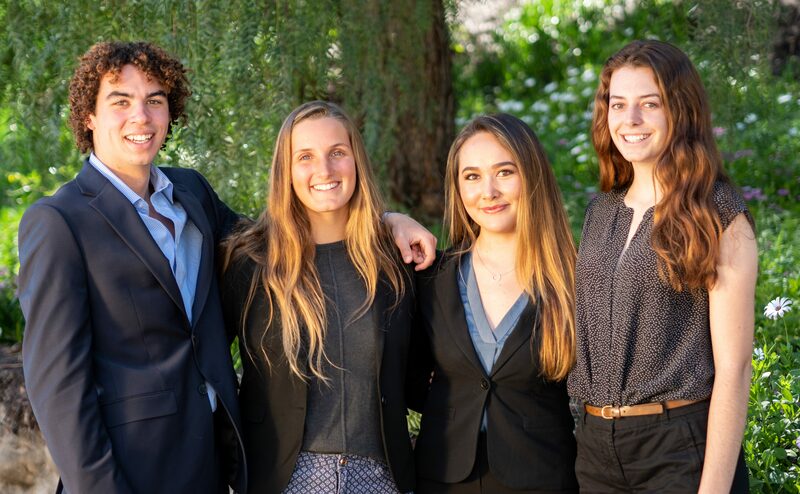 Our four Clean Air Ambassadors (left to right): Cole Hawthorne (UCSB), Maya Facciolo (SBCC), Lauren Howard (UCSB), and Michaela Freebourn (UCSB). We would like to come teach at your school! Please contact Air Quality Specialist Desmond Ho by phone (805) 961-8873 or by email: [email protected] if you are interested in having us come to your classroom.